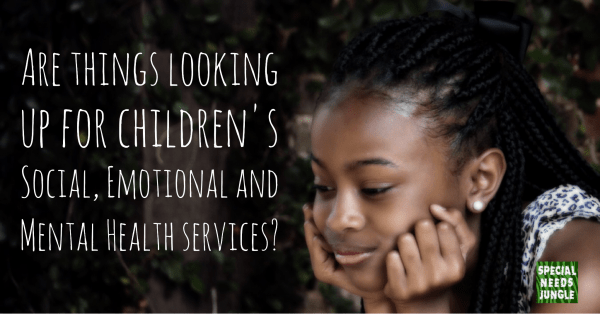 Home Health ADD/ADHD Are things looking up for children’s Social, Emotional and Mental Health services? Are things looking up for children’s Social, Emotional and Mental Health services? Every child in England designated as having a special educational need (SEN) will have a primary need falling under one of four main types: Cognition and learning, Communication and Interaction, Sensory and Physical and Social, Emotional and Mental Health. When the SEND reforms came into effect in September 2014, the decision to change the old designation BESD – Behavioural, Emotional and Social Difficulties to SEMH – Social Emotional and Mental Health needs was greeted with widespread agreement. The effect of this was to remove the ‘behaviour’ tag from the title and to focus greater attention on any emotional, social or mental health need, which might lie under ‘behaviour’. 15 months on the move is still met with approval by all I meet on my travels and in discussions with colleagues in the field of SEN.
What do the latest Social, Emotional and Mental Health stats tell us? On a general level, and as widely reported, the numbers of children identified with SEN in schools according to the government's SEND statistics, went down significantly in 2015 by 191,505 from 2014. Look out for my analysis on this in greater depth in my next SNJ blog. Specifically for SEMH the best comparator for numbers is the 2014 numbers for children identified as BESD. However, because the system changed from a method of classifying children as School Action/School Action Plus/Statement in 2014 to SEN Support/Statement/EHCP in 2015, it’s difficult to draw direct comparisons of numbers. Although we cannot be certain of the trend (The Department for Education did not collect data on Primary Need for children classified as School Action), the figures do suggest that numbers of children identified with SEMH might be on the increase; 20,000 more in primary schools, 10,000 more in secondary schools and 100 more in special schools than last year. If all that talk of numbers and classification of SEN is a bit dry, let’s move on to something more exciting. As the reforms have bedded in, there has been more of a focus around the area of social and emotional need with schools recognising the need to establish alternative and additional provisions for the children concerned. The use of ‘nurture provision’ is becoming more widespread and in a secondary provision I work with, a ‘retreat’ has been established. There’s an increasing opportunity for special schools to spread their specialist skills wider to benefit those in mainstream (92% of children with SEMH in state-funded schools are in mainstream). The government has announced major developments in the world of mental health. In March 2015 the advice for schools in terms of mental health was updated. Mental health is a priority for the government with money being invested throughout this parliament. In September 2015 the first Department for Education mental health champion was appointed. On December 3rd 2015, the government announced that 255 schools across 22 areas are piloting a joint Health and Education approach, whereby each school involved will appoint a single point of contact to develop close relationships with a counterpart in NHS Child and Adolescent Mental Health Services (CAMHS) to improve the service on offer. All of these reforms taken together should improve the provision for children with social and/or emotional needs and for those with mental health needs but it’s going to take time to get it right. For many years I have been concerned about the availability of support from CAMHS for children I have worked with, the speed at which that support is available and the understanding CAMHS workers have about special educational needs. I guess I’m feeling a bit more optimistic at present and really hope the focus on social and emotional needs and the acceptance that there is no stigma to be attached to mental health might make a big difference. If Education, Health and Social Care services can truly ‘join up’ around these issues then we stand a chance of addressing long-standing concerns. I very much look forward to hearing how the pilots go and then seeing how the lessons learned can be spread wider to benefit more children. Will these figures make councils think twice before forcing parents to the SEND Tribunal? My son was excluded age 5 on 3rd September 2015 because the school failed to acknowledge his SEMH needs despite them putting him on SEN register for SEMH. To the end the head insisted he was just naughtu and when I said his outbusrts are due to his SEMH issues she laughed and asked who says he has any SEMH problems? The level of ignorance and lack of understanding is shocking! Exactly. I went to independent review panel and the exclusion was quashed but the school still refused to readmit him. The only good thing in all of this is that he will no longer be in that terrible school and the local authority passed the £4000 fine that the old school paid to his new school who will be using it to pay for full time 1:1 support for him until his SEN paperwork is up to scratch and they can look at an EHCP or element 3 funding. The lack of support and understanding is shocking. The school also failed to appreciate the impact on my other 2 children who still attend. In fact my son’s poor behaviour was blamed on sibling rivalry!